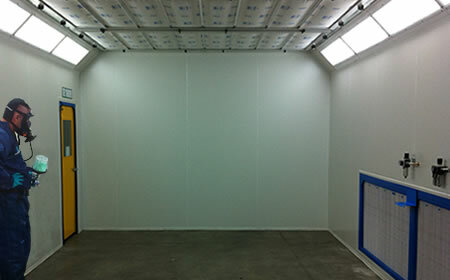 Optional: Cabin sizes can be customised to suit specific products / vehicles. The Dual Side on floor downdraft provides downdraft airflow through the entire roof of the spray booth in a Full Downdraft Style while providing floor level extraction through each of the side walls of the booth. Commonly referred to as a “split downdraught” this system is ideal if no ramps or pits are suitable for the type of spray painting being completed. 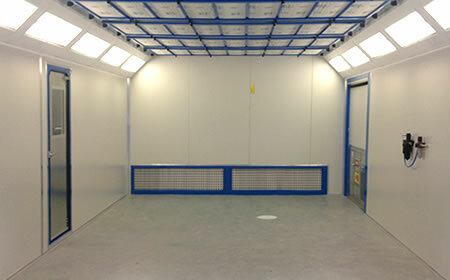 Ideal when trolleys are used to move parts or components and a clean environment with baking is required. Common Industry Uses: Aviation Parts, Heavy vehicles, Automotive repairs ( Custom cars and low volume panel shops), custom/hot rod spray painting. 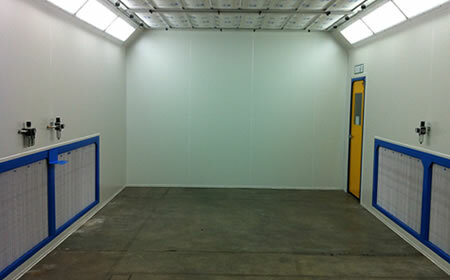 The Rear Extraction on floor downdraught provides downdraught airflow through the entire roof of the spray booth in a Full Downdraft Style while providing floor level extraction through the rear wall of the spray booth. This is commonly referred to as a convention “On Floor Downdraft”. This system provides the most direct airflow in the on floor range and is again ideal if no ramps or pits are suitable for the type of spray painting being completed. Perfect in applications when vehicles are a rolling shell or trolleys are used to move parts / components around for painting. A clean environment with baking is provided in this platform of booth. Common Industry Uses: Aviation Parts, Heavy vehicles, Rolling Shell vehicles, Automotive repairs ( Custom cars and low volume panel shops), custom/hot rod spray painting. 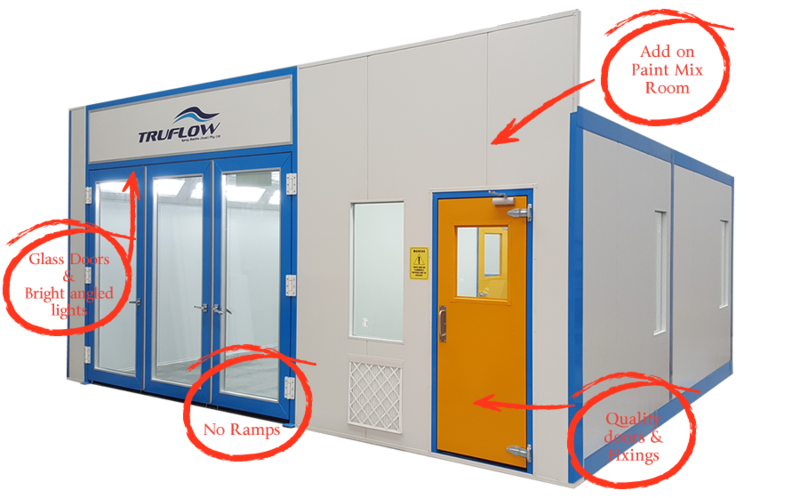 The Single Side on floor downdraft provides downdraft airflow through the entire roof of the spray booth in a Full Downdraft Style while providing floor level extraction through only one of the side walls of the booth. This single side draught application is used where limited space is available as this design typically uses the least amount of floorspace. Used if no ramps or pits are suitable for the type of spray painting being completed or of budget is in mind and ideal when trolleys are used to move parts or components. As with other models baking is included and environment is pressurised and clean with F5 Roof filtration. Australian Made products you can trust.